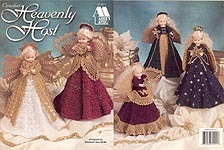 Heavenly Host, designed by Elizabeth Ann White, Annie's Attic, LLC, 1998. 5 pretty 16" tall guardian angels made using a variety of yarns, threads, and trims, and 5-1/2" air freshener dolls. 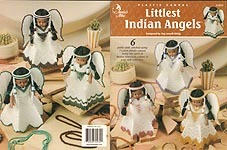 Plastic Canvas Littlest Indian Angels, designed by Kay Jewel-Uhlig, Annie's Attic, 2000. 6 cuties in Native American costume stitched on 7 mesh plastic canvas using 5-1/2" Indian Air Freshener Doll and conceals a "Renuzit" air freshener. Like new, though may smell slightly perfumey. Annie's Attic Winter Scent-sations Air Freshener Covers, designed by Cindy Harris, Annie's Attic, 1993. Seven designs worked in worsted weight yarn to cover a cone-shaped air freshener: Snowman, Angel, Teddy Bear, Penguin, Mouse, and Carolers. Like new. Lovely & Lacy Home Decor, designed by BellaCrochet, Annie's Attic, 2003. 6 pansy- inspired designs in size 10 crochet cotton include: Air Freshener Doll, Pansy tassle, Picture Frame Trim, Potpourri Bowl, Dresser Scarf, and Sachet. New. 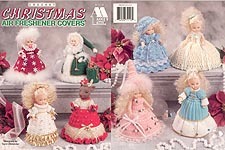 Crochet Christmas Air Freshener Covers, designed by Carol Alexander, Annie's Attic, 1998. 8 designs made with worsted weight yarn and crochet cotton: Santa, Mrs. Santa, Reindeer, Angel, Aqua, Cream, Blue, and Pink. Like new. Home Sweet Home, designed by Roberta J. Srock, Fibre- Craft, 1995. Four crochet outfits in worsted weight yarn for either Barnyard Friends or Air Freshener dolls. Like new. 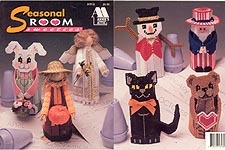 Seasonal Room Sweeties, designed by Carole Rodgers, Annie's Attic, 1993. 7 designs on 7- mesh plastic canvas to fit cone- shaped solid air freshener: angel, Black Cat, Scarecrow, Uncle Sam, Bunny, Bear, and Snowman. Price crossed off on cover, what looks like a pie crust recipe neatly written in pencil on one page! Otherwise very good condition but may smell of cigarette smoke. 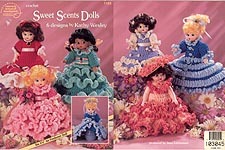 Sweet Scents Dolls, designed by Kathy Wesley, American School of Needlework, 1993. 6 floral-inspired designs in worsted weight yarn to fit 5-3/4" air freshener dolls: Cactus Flower, Bluebonnet Belle, Lavender Sachet, Peach Blossom, Miss All- American Beauty, Rose Garden. Excellent condition. 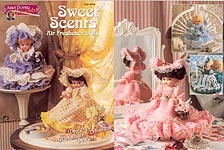 Sweet Scents Air Freshener Dolls, designed by Alexander- Stratton, Annie Potter Presents, 1996. 5 designs for 5-3/4" air freshener doll, including an angel who could also be used as a tree- topper. New. 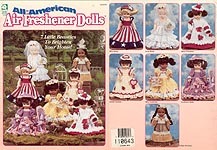 All-American Air Freshener Dolls, designed by Jo Ann Maxwell, House of White Birches, 1997. 7 designs for 5-1/2" air freshener dolls include: Miss Betsy (red, whit, & blue), June Bride, Miss Christmas, Southern Belle, Miss Sunshine, Sweet Sixteen, and Indian Princess. Like new. Annie's Attic Air Freshener Pillow Dolls, designed by Jane Pearson, Annie's Attic, LLC, 1998. Six lacy pillow dolls made with worsted weight yarn and an air freshener doll. Full-size original. Like new. Annie's Attic Air Freshener Pillow Dolls, designed by Jane Pearson, Annie's Attic, LLC, 1998. Six lacy pillow dolls made with worsted weight yarn and an air freshener doll. Digest-size reprint. Price tag residue on cover; otherwise, like new. Annie's Attic Air Freshener Bed Dolls, designed by Jane Pearson, Annie's Attic, LLC, 1998. Five sweet dolls made with worsted weight yarn and an air freshener doll. Excellent condition. Baby Air Fresheners, designed by Vicky L.Tignanelli, Fibre-Craft, 1996. 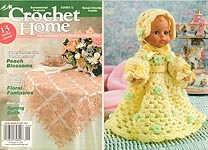 Patterns for Big Crochet 2 baby-fresh outfits for 5-1/2" air freshner dolls. Also includes charts for accessory caddies in plastic canvas needlepoint. 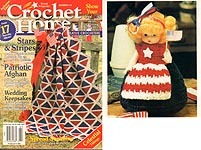 KNIT Home Helpers, designed by Joan Gilbert, Craftime Limited, 1998. 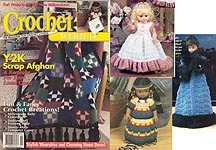 Designs to KNIT with pockets around hemlines to hold miniatures or accessories include: Bathroom Helper, Kitchen Helper, Sewing Helper, Gardening Helper. May have tag on cover, but otherwise excellent condition. Plastic Canvas Sweetheart Sack Savers, designed by Fran Rohus, The Needlecraft Shop, 1999. Five designs created using 7- mesh plastic canvas and air freshener dolls. Pink Dress & Baby Doll, Fibre-Craft, nd. Dress, and baby doll outfit for a 5-3/4" air freshener doll to crochet using worsted weight yarn. Folded single- sheet nstructions originally packaged with Air Freshener Doll. Used -- wear along folds. May smell slightly of cigarette smoke. Little Bo Peep, designed by Vicky L. Tignanelli, Fibre-Craft, 1996. 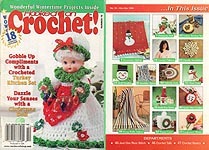 Dress, bonnet, and staff for a 5-3/4" air freshener doll to crochet using sport weight yarn. Pattern for sheep also included. Instructions in both English and French, originally packaged with Air Freshener Doll. New. 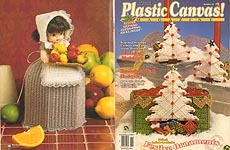 Plastic Canvas Holiday Air Fresheners, designed by Sandra Miller- Maxfield, The Needlecraft Shop, 1995. Designs worked on 7- mesh include: Easter Chick- Chick, Pink Cottontail, Eggs & Treats Bear, U- S- Air Freshener, Boo-tiful Ghostie, Wicket Witchlet, Spooky Black Cat, Jolly Saint Nick, Christmas Jewels. Like new. Ariel, designed by Debby Caldwell, Fibre-Craft, 1996. Two beautiful dresses for a 5-1/4" air freshener doll using sport weight yarn and crochet cotton thread. Like new, but may smell slightly "perfumey." Ariel, designed by Debby Caldwell, Fibre-Craft, 1996. Two beautiful dresses for a 5-1/4" air freshener doll using sport weight yarn and crochet cotton thread. Light pencil marks by some rows, but otherwise very good condition. Plastic Canvas Bear Air Freshener Cover, designed by Christina Laws, The Needlecraft Shop Plastic Canvas Collector's Series, 2000. Worked on 7- mesh. Pattern leaflet from subscription series in excellent condition, but may smell of cigarette smoke. 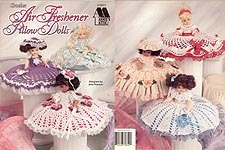 Crochet Feather Duster Dolls, designed by Jane Pearson, The Needlecraft Shop, 1997. Turn plain feather dusters into Pretty Maids with air freshener dolls and 7 dresses crocheted in worsted weight yarn. Tag residue on front cover, yellowish- brown stain all over back cover, as if it were laid in something. Pages in excellent condition, however. Nursery Favorites, designed by Vicki L. Tiganelli, Fibre- Craft, 1996. Four crochet outfits in sport weight yarn forAir Freshener dolls: Little Bo Peep & Her Sheep, Cow Jumped Over the Moon, Cat & the Fiddle, This Little Piggy Goes to Market. Like new. Crochet Southern Belle, NADCO Inc. for Wal-Mart, nd. Single sheet pattern; outfit worked in worsted weight yarn. Wavy, but overall good used condition. Crochet Indian Princess, designed by Sandra Miller- Maxfield, The Needlecraft Shop, 1996. Pattern card from kit for 9" tall doll. Excellent condition. Miss Bunny, designed by Patricia Pogue, Leisure Arts Lites, 1993. Miss Bunny Hareington hides a container of air freshener beneath her skirt. Works up quickly in worsted weight yarn. Very good condition. Christmas Scents, designed by Susan Jennings, Fibre-Craft, 1995. Santa & Mrs. Claus air freshener dolls crocheted in worsted weight yarn. Like new. Christmas Scents, designed by Susan Jennings, Fibre-Craft, 1995. Santa & Mrs. Claus air freshener dolls crocheted in worsted weight yarn. Note re: hook size on one page, small "drip" stain (possible coffee) on same page. Otherwise, very good condition. 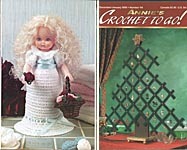 Crochet Scents of Spring Dolls, designed by Jane Pearson, Annie's Attic, LLC, 1996. Four pretty dolls made with worsted weight yarn and 3-3/4" doll heads. Like new. Plastic Canvas Air Freshener Little Ladies, designed by Sandra Miller-Maxfield, The Needlecraft Shop, 1994. 5 designs on 7- mesh plastic canvas to fit 5-3/4" air freshener dolls include: Angel, Bride, Southern Miss, Mermaid, and Girl in Car. Like new. Crochet Air Freshener Beauties, designed by Jan Hatfield, The Needlecraft Shop, 1994. 7 frilly dresses and matching hats crocheted with colorful sports yarn for 6-1/2" air freshener doll. Slight dark discoloration in margin at center seam down to top staple, but otherwise excellent condition. May smell of cigarette smoke. French Missy, designed by Jane Pearson, The Needlecraft Shop, 1999. 6 delightful dresses to crochet in size 10 cotton thread, for 6-1/2" air freshener doll. Like new. Air Freshener Maidens, designed by Frances Hughes, The Needlecraft Shop, 1993. "Bring a breath of fresh air into your home with 5 beautiful Air Freshener Cover Dolls" worked in sports weight yarn and Size 5 crochet cotton, with a variety of trims. Like new. Scented Sweeties I, designed by Vicki Action, Fibre-Craft, 1993. Crochet a Spring or Summer dress fora 5-3/4" air freshener doll, in knitting worsted weight yarn. Leaflet is battered and dented as if it had been carried in bag with work in progress, also has marks in margins to keep track of rows. Scented Sweeties II, designed by Vicki Action, Fibre-Craft, 1993. 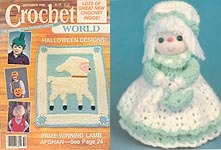 Crochet a Fall or Winter dress fora 5-3/4" air freshener doll, in knitting worsted weight yarn. May have tag residue on cover; otherwise like new. Fawn, designed by Roberta R. Srock, Fibre-Craft, 1996. Adorable outfit for Indian Air Freshener Doll, 5-3/4" air freshener doll, in sport weight yarn. Price tag on cover, but otherwise very good condition.. Kitchen Witches, designed by Sharon Christensen, The Needlecraft Shop, 1998. 5 magical dolls crocheted using worsted weight yarn. Fits any 5-1/2" air freshener doll. Small notes on a couple of pages that look like pattern corrections. Otherwise, very good condition. Kitchen Granny, designed by Vicky L. Tignanelli, Fibre-Craft, 1996. Outfit crocheted in sport weight yarn for 5-1/2 inch Granny air freshener doll; miniature silverwear and food fit in pockets of skirt like a kitchen "peddlar doll." 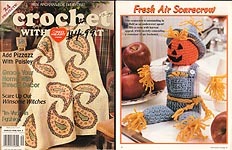 Spooky Treasures, designed by Susan Jennings, Fibre-Craft, 1995. Outfit crocheted in worsted weight weight yarn for 5-1/2 inch Granny air freshener doll cover containers for hidden treasures. Pandora, designed by Davida Lawless, Fibre-Craft, 1996. Pumpkins adorn the skirt on this outfit crocheted in worsted weight yarn for 5-1/2 inch Granny air freshener doll. Excellent condition. Halloween Scents, designed by Sandra Miller Maxfield, 1996. Pattern includes Dress, Hat, and spider. Very good condition. Plastic Canvas Bewitching Friends, designed by Sandra Miller-Maxfield & Jessie L. Lampin, The Needlecraft Shop, 1996. Directions for Witche's Dress & Hat, Skeleton, and Pumpkin. Like new. Air Freshener Covers "Decorative Series" Set 1, Td creations, 1989. 5 covers using 3" Mouse or doll Head. Fit cone-shaped air fresheners. Some cover wear; otherwise, very good condition. Air Freshener Covers "Decorative Series" Set 2, Td creations, 1990. 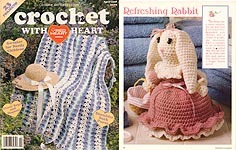 5 covers using 3" Mouse, Bunny, or doll head. Fit cone-shaped air fresheners. Excellent condition. Air Freshener Covers "Decorative Series" Set 3, designed Jan Hatfield, Td creations, 1992. 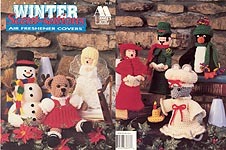 5 covers using 3" Bear (or doll) Head. Fit cone-shaped air fresheners. Like new, though may smell slightly "perfumey." Air Freshener Covers, Set 4, Td creations, inc., 1992. 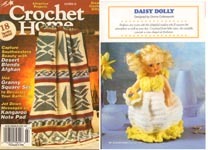 Five covers crocheted in sports yarn to use with 3" doll heads. Like new. Air Freshener Cover Girl Dolls: Breanne & Lisa, Td creations, inc., 1996. Two covers crocheted in sports yarn to use with air freshener doll heads/ bodies. Very good condition. Air Freshener Cover Girl Dolls: Debbie & Tina, Td creations, inc., 1996. Two covers crocheted in sports yarn to use with air freshener doll heads/ bodies. Excellent condition. 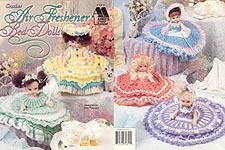 Air Freshener Cover Girl Dolls: Kelly & Peggy, Td creations, inc., 1996. 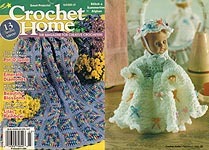 Two covers crocheted in sports yarn to use with air freshener doll heads/ bodies. New.